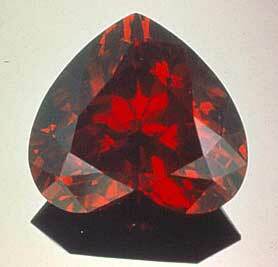 Cut and polished garnet; photo © International Colored Gemstone Association (all rights reserved; used by permission). Barton Mines in the Adirondack Mountains of New York is the world's largest garnet mine, mining mostly industrial abrasive grade garnet (used for polishing glass and metal), but gemstone quality garnet is found occasionally. Garnets have been considered precious for thousands of years and are found in early Egyptian, Greek and Roman jewelry. Red is the garnet's principal color, but garnets actually come in several hues, including various shades of green, a light to intense yellow, a fiery orange, and some earth-colored hues.